Nice old cutting this, from the ‘Boston Sunday Globe’ 31 May 1992. Click for the full size image. The attempt to remove dissenting voices from the media has been in full swing for 20 years. Lewdandorky’s attempt to get man made global warming sceptics written off as ‘lunar landing deniers’ is just another route to the same goal. These people are unable to convince the public via fair open debate with their intellectual opponents, so they resort to smear tactics and lies. UPDATE: Geoff Chambers has taken the trouble to transcribe the article to help combat ‘internet amnesia’ of pre millenium events. word doc here. It is journalistically irresponsible to present both sides as if it were a question of balance. Given the distribution of views, with groups like the National Academy of Science expressing strong scientific concern, it is irresponsible to give equal time to a few people standing out in left field. The overall weight of evidence … is so clear that one begins to feel angry toward those who exaggerate the uncertainty. 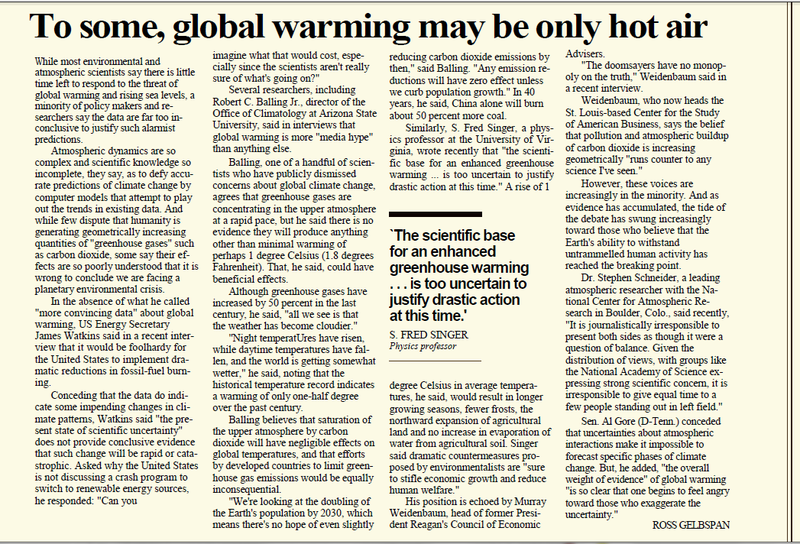 My heartfelt hat tip goes to Australia’s Brenton Groves for supplying me with that scan and the larger “Racing to an environmental precipice: Fear of future on deteriorating planet sets agenda for Rio de Janeiro summit” May 31, 1992 Boston Globe article containing it. My thanks to you for spreading the word of how this is a 20 year boilerplate smear. It is 3 simple talking points: “settled science” / “corrupt skeptics operating in a parallel manner to old tobacco industry shills” / “the media is not obligated to give skeptics equal balance because of the first two points”. Ross Gelbspan consolidated this 3-point mantra into the successful smear it became after late 1995. The story must be told far and wide, and I can use all the help I can get in telling it. Glad to be of assistance Russell – TB. Good Weidenbaum quote: “The doomsayers have no monopoly on the truth”. 20 years and no progress in the debate! Something’s gotta give; a tsunami of common sense to sweep away the accumulated ‘green’ BS of 40+ years is sorely needed. If gullible Western governments continue to kowtow to the Gaia religionists, we really are doomed. I’ve always said the Greens and the Govt make strange bedfellows. It’s more a matter of incidental benefits than coincident aims I think. The Greens get paid by the Govt to lobby the Govt to do what the Greens want, and the Govt gets to collect more tax along the way, while finding a convenient figleaf for their failed energy policy. It’ll end badly for the Greens, because it doesn’t matter who you vote for, because the Govt. always gets in. Unless you voted Green of course, but very few of the public who allegedly believe the AGW story are prepared to do that. So once reality bites, the Govt will have a convenient scapegoat for accepting the crap science and the Greens will go under the bus. We shouldn’t forget that Stephen Schneider, leading light of the man-made global warming theory was also responsible for the production of a blacklist of scientists who disagreed. My thanks to you for spreading the word of how this is a 20 year boilerplate smear. It is 3 simple talking points: “settled science” / “corrupt skeptics operating in a parallel manner to old tobacco industry shills” / “the media is not obligated to give skeptics equal balance because of the first two points”. Ross Gelbspan consolidated this 3-point mantra into the successful smear it became after late 1995. The story must be told far and wide, and I and can use all the help I can get in telling it. Russell, welcome, and thanks for adding detail and further material to this story. Schneider and his media connections and black lists are one of the most profoundly important stories around the corruption of the scientific process in the climate arena. Russell, please comment again using an email address I can contact you at – Thanks. And my thanks right back at you for elevating my comment to the main text. Trust me on this, there’s so much more. At my WUWT guest post on the Lewandowsky paper, I mention Myanna Lahsen’s ties to Gelbspan, but didn’t have the space to go deeply into it. She is one who apparently has seen firsthand the Western Fuels Association “reposition global warming as theory rather than fact” memo, which Gelbspan made a 2nd career out of exploiting. Waaaay too many coincidences in this whole smear, I could go on for another 1000 words or more. Oops, didn’t see your above comment ’til after I posted the above. Comment here done with an email contact. Thanks for your interest, relay all this to my pal James Delingpole if the opportunity pops up. He took interest in my work last year (http://jamesdelingpole.com/wordpress/wordpress/blog/my-incredible-big-oil-funded-life-1650/). Never have had the chance to correspond with Christopher Booker yet, despite James giving me his email address…. The internet has no long-term memory. Anything prior to circa 2000 might as well not exist. Ignorance of history and obsession witrh real time data is one of the key failings of the warmist movement. I’m transcribing this text to aid in its transmission. It’s something I might do for other key texts which only exist on the net as scans. Send me a mail so I can send it without cluttering up the comments. I’m open to suggestions for other scans to transcribe. Post updated with Geoff Chamber’s transcription – many thanks Geoff.